Sometimes you just need a little chocolate, you know? Everyone has their vices. Some people get high, some people get drunk, but my drug of choice is chocolate. After a long stressful week, I decided I needed chocolate. I also decided that I didn’t need to eat a whole chocolate cake by myself, so making cupcakes and freezing some for later seemed like the logical choice. The cupcakes are an Ina Garten (Barefoot Contessa) recipe, halved to make a perfect dozen. The original recipe calls for them to be topped with a rich, creamy peanut butter frosting. 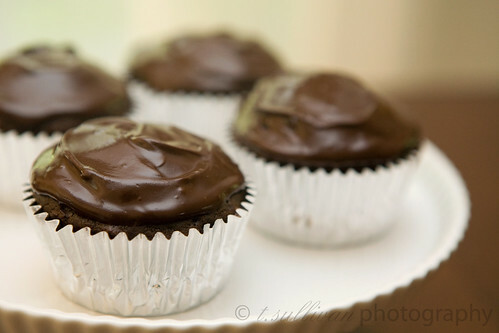 While the combination of peanut butter and chocolate is one of my all time favorites, my goal on this occasion was to cram as much chocolate as I could into one little cupcake. I recently got a new cookbook, Cooking From My Home to Yours by Dorie Greenspan. It has Dorie’s recipe for chocolate chocolate cupcakes (which I decided not to use, for reasons I can’t remember now) with a decadent chocolate glaze – just the kind of topping I was looking for. 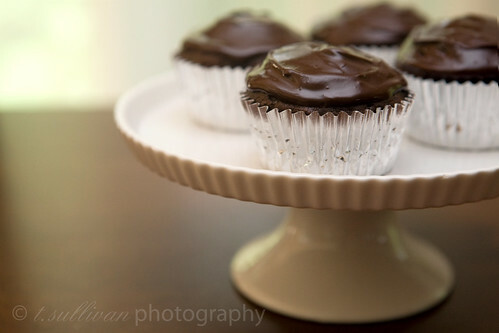 So here are the results of my Ina Garten cupcakes with Dorie Greenspan chocolate glaze – heavenly chocolate cupcakes! Even though I didn’t use good quality chocolate and I slightly over baked them, they are exactly the chocolate treat I was craving. I have a feeling I’ll be making these again! Melt the chocolate in a heatproof bowl over a saucepan of shimmering water. Transfer the bowl to the counter and let stand for 5 minutes. Using a small whisk or rubber spatula, stir the confectioners’ sugar into the chocolate, followed by the pieces of cold butter. The glaze may be very thin at this point or may be perfectly spreadable. If it is too thin to spread or use as a dip (I often dip the tops of the cakes into the ganache, then give the cakes a little twirl as I pull them out, so they have a squiggle of glaze in the center), stir it over ice water for a few seconds – really less than a minute. With a small metal icing spatula, give each cupcake a crown of shiny ganache, and let the glaze set at room temperature (or in the fridge if you are in a hurry). If the ganache loses its gloss and you miss it, give the tops of the cakes a puff of hot air from a hairdryer right before serving.